Derek Gilchrist, our CEO and Chief Scientific Officer shares his entrepreneurial journey, and the story of establishing the bio pharmaceutical spin out. Causeway Therapeutics has been awarded a grant of £1.3m from Innovate UK to develop a promising new treatment for a common but costly musculoskeletal problem. To treat tendinopathy in humans, Causeway has developed TenoMiR, which switches off disease pathways, restoring tendon function and structure. The company will use this new grant to begin Phase 1 human trials for their new therapy for the treatment of tendinopathy in 24 patients early next year. Mr Neal Millar, co-founder and Chief Medical Officer, added: “Tendinopathy represents a serious unmet clinical need, with one in three GP consultations in the UK being due to soft tissue tendon disease. The trials will see the TenoMiR technology – a replacement therapy – locally injected into injured tendons, with the hope it will restore the tendon to ‘injury-free’ levels and fault-free tendon repair. A University of Glasgow spinout which is developing a promising new treatment for tendon problems in humans and horses has received a £1m investment from Mediqventure and the Scottish Investment Bank, the investment arm of Scottish Enterprise. Causeway Therapeutics develops therapies for tendon injuries and disorders, collectively known as tendinopathies. Tendinopathies are extremely common, accounting for between 30 and 50% of all sporting injuries. Around 1 in 10 people will be affected by tendinopathies in their lifetime, usually caused by repetitive strain or major trauma. Treatment for tendinopathies cost the NHS £250 million per year, often with unsatisfactory results for patients. The worldwide market for treatments is estimated at around £3.85bn. While working in the laboratory of Professor Iain McInnes at the University of Glasgow’s Institute of Infection, Immunity & Inflammation, Causeway co-founders Dr Derek Gilchrist and Mr Neal Millar discovered that a single microRNA-miR29a plays a key role in regulating the production of collagens, the proteins that give tendons their strength. Replacement of Type I collagen with Type III collagen is characteristic of tendinopathy; loss of miR29a in human tendons drives an increase in Type III collagen production. Causeway’s lead product, TenoMiR™, is a replacement for the natural miR29a that is depleted in tendinopathy. “Our lead product is a completely novel approach to tendon disease. I am delighted to be associated again in a meaningful way with the University,” said Declan Doogan, a Partner at Mediqventures. Declan, an alumnus of the University of Glasgow and Visiting Professor at the Medical School will be joining Causeway’s board as Chairman. In addition to developing TenoMiR™ as a human therapeutic, Causeway is developing an analogous therapy for horses suffering tendinopathy. It is estimated that tendinopathy affects between 10 and 30% of competitive and working horses. At the moment the most common therapeutic option is a long period of box rest that only helps in 50% of cases. In addition to being a significant welfare issue for the horse, equine tendinopathy is a substantial financial and practical burden on the owners. Initial studies of EquiMiR™ in horses have shown significantly improved tendon healing when compared to untreated animals. Mediqventures is a biotech merchant bank and investment firm founded by successful entrepreneurs Jim Mellon, Gregory Bailey, and Declan Doogan in order to identify, finance, and develop promising technologies in the life sciences. Mediqventures provides equity financing either directly to portfolio companies or to single-asset collaborations with existing companies. In addition to providing capital, Mediqventures provides its portfolio companies with access to a network of seasoned drug-development professionals that join our portfolio companies in an advisory or executive role in order to provide expertise in the validation of discovery programs, preclinical development, CMC, the preparation and submission of INDs, translational science, clinical development, business development, finance, and intellectual property development. The University of Glasgow has been inspiring people to change the world for over 550 years and is a member of the prestigious Russell Group of leading UK research universities. As a world top 100 university with annual research income of more than £181 million and overall student satisfaction rate of 91%, the University of Glasgow is committed to delivering world class research at the same time as the highest standards of teaching and education. The Scottish Investment Bank (SIB) is the investment arm of Scotland’s main economic development agency, Scottish Enterprise, operating Scotland-wide in partnership with Highlands and Islands Enterprise. It manages a suite of co- investment funds including the Scottish Co-investment Fund and the Scottish Venture Fund, which are partly funded by the European Regional Development Fund (ERDF), and the Renewable Energy Investment Fund. SIB is also an investor in Epidarex Capital’s life sciences fund and is a participant in the Scottish European Growth Co-Investment Programme alongside the European Investment Fund. SIB’s investment funds support Scotland’s SME funding market to ensure businesses with growth and export potential have adequate access to growth capital. SIB also provides a team of Financial Readiness specialists to help companies prepare for new investment and access appropriate finance. FDA grants Causeway Therapeutics a sponsor fee waiver under the significant barrier to innovation provision of ADUFA (Animal Drug User Fee Act) for FY 2016. The fee waiver was granted based on the assessment that Causeway is pursuing innovative drug products and technology with the development of EquiMiR™ for the treatment of tendon injuries in horses. This incentive supports Causeways development of innovative drugs and facilitates interactions and discussion with the FDA regarding the development and the regulatory process of EquiMiR™ towards marketing authorization in the US. Jan 2016 - Causeway presence at European Animal Health Investment Forum, February 10-11, 2016 at the Royal Garden Hotel in London, UK. 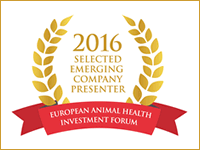 Causeway have been selected to be one of the twelve emerging animal health companies who will be presenting our innovations to an audience of financial investors and big pharma representatives at the first and only European Animal Health Investment Forum, taking place February 10-11, 2016 at the Royal Garden Hotel in London, UK. We will be joined by 100+ influencers and decision-makers from the animal health industry including companies such as Zoetis, MSD Animal Health, Merial, Boehringer Ingelheim, Bayer Animal Health as we discuss the big picture of animal health. BIO-Europe® is Europe's largest partnering conference serving the global biotechnology industry. The conference annually attracts leading dealmakers from biotech, pharma and finance along with the most exciting emerging companies. Causeway has attracted strong feedback on both technology and business development and is following up on many leads. July 2015 - Causeway's Discovery Shortlisted for Inaugural Herald Higher Education Awards. The Causeway team are delighted to be shortlisted for 'Research Project of the Year' in the Inaugural Herald Higher Education Awards. Causeway CMO Neal Millar discussing tendinopathy and Causeway's microRNA therapy. EquiMiR™ has been granted Minor Use Minor Species status by the European Medicines Agency considerably reducing data required to obtain a Marketing Authorisation (MA). Scientists are investigating a new therapy for the treatment of tendon injuries such as tennis elbow and Achilles tendinitis after gaining new insight into the condition. Tendon injuries (tendinopathies) are common, accounting for 30-50% of all sporting injuries, and are usually caused by repetitive strain or major trauma.While many people recover after a period of rest, a significant number of people do not because the structure of the tendon itself has permanently weakened. Healthy tendons, connecting muscles to bones, are primarily composed of type-1 collagen, a very strong material. When injured the body responds by producing the inferior type-3 collagen to quickly repair the damage. This type of collagen is not as strong as type-1 and is more prone to damage. Normally, over time, type 3 is replaced by the stronger type-1. However, in some people, repetitive damage means the body never replaces the weaker type-3 collagen, leaving them with inherently weaker tendons and long-term symptoms, such as pain and reduced mobility. Scientists at the University of Glasgow are trialing a new therapy (TenoMiR™) for treating tendinopathy after being awarded a High Growth Spinout grant from Scottish Enterprise. The trial will use injections of microRNA – small molecules that help regulate gene expression – into the tendon to ‘dial-down’ the production of type 3 collagen and switch to type-1. The Glasgow team have already been successful in making the switch in cultured cells in the lab and in mice. They will now work with international collaborators to trial the treatment on horses, which also frequently suffer tendon injuries, particularly in racing.Following this trial, the team intends to commercialise the treatments through a spin-out company called Causeway Therapeutics focusing on bringing safe and effective medicines to human and veterinary markets. Neal Millar, an academic consultant orthopaedic surgeon and clinical senior research fellow at the University of Glasgow, said: “Tendinopathy is essentially the result of an imbalance between collagen type-1 and type-3 and we have discovered the molecular cause. This breakthrough has allowed us to find a way to alter the levels of collagen type-3 in tendons, with the ultimate aim to get patients with tendon injuries better quicker." Results of the previous studies by the team, which also includes Professor Iain McInnes, Director of the Institute of Infection, Immunity and Inflammation within the University are published in Nature Communications and reveal the role of the microRNA 29a in tendon tissue repair. The scientists found that a single microRNA - miR-29a – through its interaction with a protein, interleukin 33, plays a key role in regulating the production of collagens in tendon disease. Loss of miR29a from human tendons results in an increase in collagen type-3 production; a key feature of tendon disease. Replacement of miR-29a in damaged tendon cells in the laboratory restores collagen production to pre injury levels. The research was supported by the Scottish Funding Council, Wellcome Trust and the Academy of Medical Sciences.